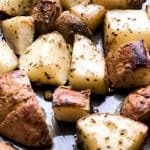 Easy Greek Roasted Potatoes are a great family-friendly weeknight side dish! Combine everything except potatoes in a large bowl and whisk until blended. Coat potatoes in mixture in either a large plastic bag or large bowl. Spread potatoes in a single layer on the prepared baking sheet. Roast uncovered for 50 minutes or until golden brown.